Ooh, this is an interesting one. Dynamic Forces is a company that creates collectible comics, signed, slabbed, remarked versions of comic books (and occasionally accidentally reveals a missing Poison Ivy Heroes In Crisis special) did something similar for Batman: Damned #1. Because Batman: Damned #1 is a $60-$70 book on eBay. A signed copy by Brian Azzarello sells for $125. A CGC slabbed copy is selling for $250-$300. 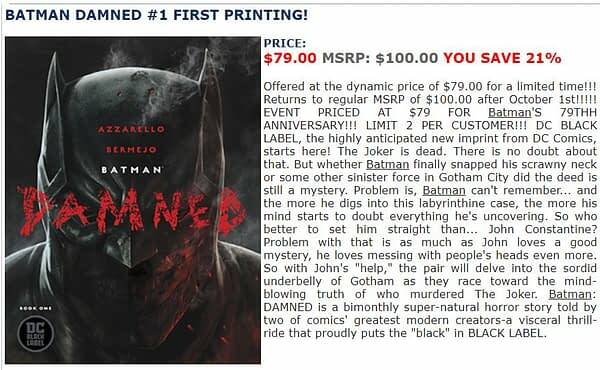 But from Dynamic Forces, a signed copy by Brian Azzarello is $49.99. And a CGC copy is $49.99. And today is FOC, the last day retailers can order them for their stores. And the shipping date will be the 3rd of October. Will they be honouring orders? Their website has some alternative… prices. A CGC slabbed copy goes for $199.99, which is still less than the going rate while a standard copy is… $79.99. Which is where it probably will be in a few days. It is after all the company’s current best-selling item – and the Jim Lee variant has sold out at the same price.